Very elegant masha'Allah! I particularly like the interesting draping detail of the jacket. this is so simple, modest yet uber chic. What a great outfit! I love the sleeves and the top is REALLY NICE - nice frill-type detail at the hips. I really like this outfit. It's simple but stylish. OOOH! A Somali hijabi here again. Wonderful body and matching outfit. What a beauty!!! this is very, very pretty, masha'Allah! Anonymous, I feel a little uncomfortable hearing a person's body spoken of in quite that way, especially in an Islamic context. Quite frankly, I nearly choked. Am I missing something here, or am I not the only person who feels this way? Re: the comment above. I agree that it is really inappropropriate to mention a person's body in that way especially as they are doing their best to cover themselves Islamically. The outfit is great; smart, but not too fussy. Very beautiful overall outfit, masha'Allah. 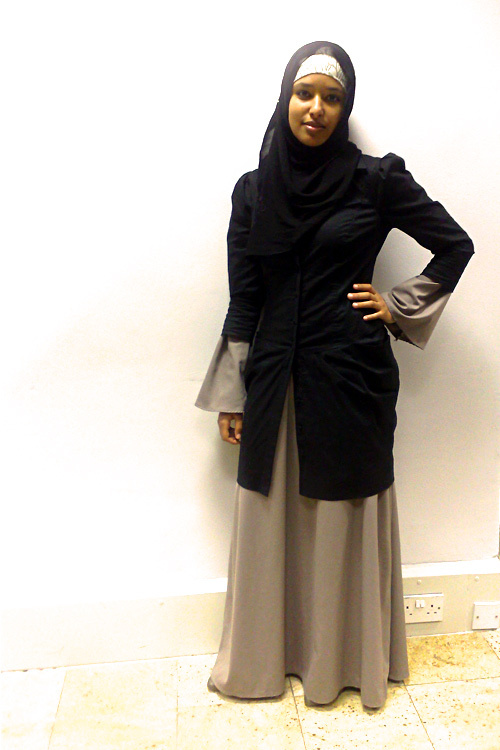 This sister makes jilbab look good. blech I hate that there are those like the anonymous commenter above who will still make degrading remarks about a modestly dressed woman. I am not 100% sure Anonymous' intentions were actually impure. But what I wrote above applies even if they were pure.